When I saw a mysterious gold stairway on the cover of The House at Riverton by Kate Morton, I liked it so much that I immediately decided to read the first few pages of the book. The book starts with the main character, Grace Bradley, having a nightmare in which she sees a girl named Hannah who tells her “You’re too late.” In Grace’s hands was a dead foxhound. I was hooked. I wanted to know more. 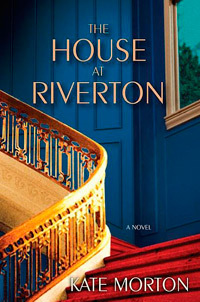 The House at Riverton was different than the books I usually read because it takes place in Great Britain during World War I, and I usually read books that take place in current times. But I liked how Morton developed the suspense and created the characters. Grace was 14 when she was sent to the Ashbury family to work as a servant. Her family was poor, and she needed the money to support her mother. The Ashburys were a well-respected family and very wealthy. Grace meets Hannah and Emmeline, daughters of the household, along with David, the oldest brother. Grace becomes friends with Hannah, who is the same age. The story bounces between the past and the present when Grace is 98 years old and living in a nursing home. When a director visits Grace and tells her that she would like to make a movie about Riverton’s past, Grace starts to remember the things that happened during her time spent there. My favorite part of the book is the mystery that revolves around how David’s friend Robbie Hunter dies. He commits suicide but not everything is at it seems. It was really interesting how he started out as a minor character when he was first introduced as a friend, but then turns into a main character in Hannah’s and Grace’s lives. I felt excited learning about the events that lead up the suicide and I kept reading to find out the truth. I loved the relationship that develops between Grace and Hannah, which showed that people of different social classes can get along. At the time, there was a huge gap between the rich and the poor. Their friendship was unique because even though Grace is a maid, Hannah slowly trusts her more and more. Grace would constantly help Hannah even if what Hannah was doing was wrong. Though Grace and I are in different time periods, it was easy for me to connect with her as someone who wants to understand why there are limitations in society and wants to get to know people who live in different worlds. I would recommend this book even though the ending did make me cry a little. Imagine being suddenly taken away from your family by an oppressive government and being thrown into an area with 23 other people to fight to the death in an event televised by the government as entertainment. That is basically The Hunger Games in a nutshell. Written by Suzanne Collins, The Hunger Games follows 16-year-old Katniss Everdeen as she fights for her life. The book is based in the near future. A powerful city, the Capitol, controls 12 districts of slaves. The districts rebelled against the Capitol in the past and were brutally defeated. As punishment, the Capitol created the Hunger Games, where each district picks two teenagers, via lottery, and sends them to fight to the death for the Capitol’s enjoyment. Katniss’s younger sister Prim is chosen and Katniss volunteers to take her place. It is the plot that really sets the story apart from anything I’ve read. As soon as I thought I knew what was going on, something would happen that would blow my mind. 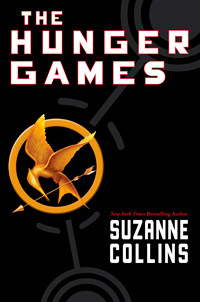 The treachery, alliances, friendships and gruesome battles make The Hunger Games exciting to read. One particularly intense action scene is when Katniss is trapped in a tree by five enemies. She manages to escape only by throwing a nest of poisonous bees at them. Although she manages to wound or kill her pursuers, she gets stung multiple times as well. While hallucinating because of the poison, she struggles to steal a bow and get to safety before she is knocked unconscious by the poison. I thought The Hunger Games was a great book. Once I started reading, I didn’t put it down until I finished three hours later. Full of action, some romance and tragedy, it will keep anyone enthralled until the final page. Underneath all of the nonstop action, The Hunger Games poses serious questions about morality, poverty and death. I would definitely recommend The Hunger Games and its sequels, Catching Fire and Mockingjay.